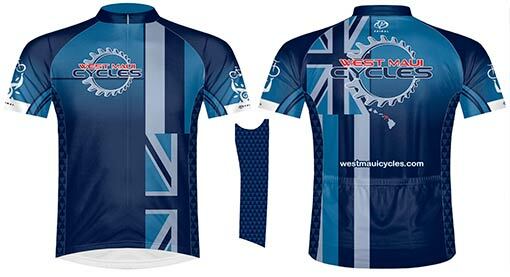 A new West Maui Cycles bicycle jersey. Maui petroglyph bike jersey at West Maui Cycles. Great Memories of the fun bike rides you took on Maui – What could be better than a vacation souvenir you'll actually use! Every time go for a bike ride wearing your West Maui Cycles bike jersey, shorts or bib, you’ll remember the fun you had exploring Maui on a bike! You can be comfortable knowing bike clothing you purchase from us will last to keep your cycling vacation memories alive. From road bike gear to clothing for mountain biking, our cycling gear comes from the best manufacturers and suppliers. Meaning, your Maui logo wear bike jersey is built to last! Pick up a pair of padded cycling shorts and a matching jersey! New Designs with Exciting Graphics at West Maui Cycles – In addition to new bike jerseys and cycling shorts emblazoned with our popular petroglyph man hoisting a bike logo, our latest custom design features the island chain with Hawaiian flag motif and a new West Maui Cycles logo. The jersey design includes a tribal accent under the sleeves and on the legs of the cycling bib. See all the loge bike gear the new designs and order online if you can't visit our Maui bike store or forgot to pick something up. Convenient and Easy to Buy Bike Clothing on Maui – Our family owned bike store in Lahaina is easy to get to and you’ll enjoy talking story with our professional bike mechanics and bike store owners. If you forget to purchase something, our online shopping cart makes it easy to purchase our Maui bike logo wear after you get home from your cycling vacation. Primal bicycle clothing with West Maui Cycles custom logo design. High Quality Cycling Gear – Our bike bibs, cycling shorts and bike jerseys are top of the line made from high quality breathable fabric intended for function with durability. The latest designs are manufactured for our Lahaina bike shop by Primal custom cycle clothing. Need a new bike jersey, cycling shorts or any other bike clothing from West Maui Cycles? Stop by the bike shop in Lahaina or order online. If you are on Maui, come by our bike store in West Maui. One of our bike mechanics or bike shop staff is out riding a bike on Maui everyday. Meaning, our bike shop is the best place to find out about the latest Maui road bike rides or mountain bike trails. Rent a bike on Maui, get your bike repaired or tuned up, or take a look at the latest performance road bikes and mountain bikes for sale. If you love cycling on Maui, get into the shop and check out all the new bikes and gear.